Nobody wants to spend more money than required, and sometimes being cautious really helps in achieving that. From my own wedding, I have learnt a lot in terms to how to deal with wedding vendors. it helped me bring down my costs, made me aware of the hidden charges and there was less scope of hidden costs. The first rule of signing any deal with any vendor is to ask him to send you a detailed copy of what’s included in the package over email. Both hard and soft copy. Duly signed. You shouldn’t pay any money otherwise till that paper is there in your email box. No advance, nothing. I have jotted down 40 wedding venue questions…that you can simply use as a checklist, just to make sure that you don’t get into any trouble later on. Tell me if I have missed anything from the list. Is the wedding date available? Are there other weddings scheduled the same day at the venue? Number of people the place can accommodate. Is this seated or standing? When can I see a wedding in near future with the maximum guest count? 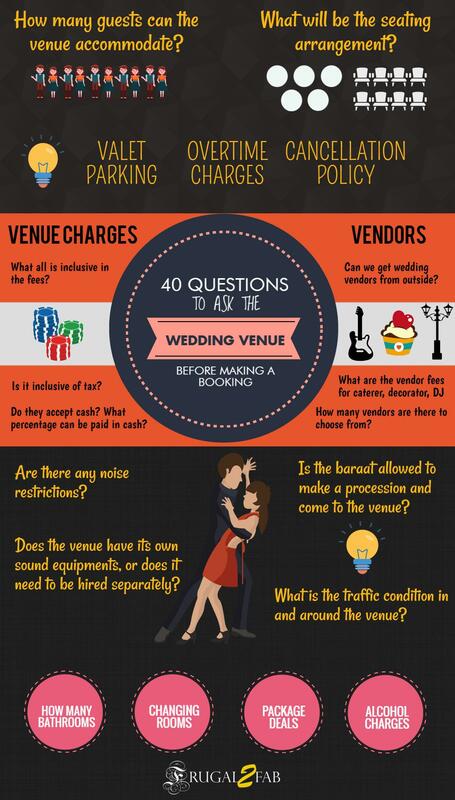 What are the venue charges? What all in inclusive in that? Are tables, chairs inclusive of the venue charges? How long can we book the venue? What are the overtime charges? Is it per hour or half day basis? What is the difference in costs? How much is the deposit? When will it be refunded? Are taxes included in these charges? What’s the way of evading taxation? Do they accept cash? What %? How much is the security deposit? Is it flexible? What is the grand total amount that will be spent after all the taxes and charges are accounted for? How late can we cancel and still get a refund? What is the provision for brides changing rooms? Do you give a room to the groom as well? How many bathrooms available for wedding guests? Who is the main venue coordinator who will be assigned for the wedding? If the marriage and reception are in the same venue back to back, can the staff handle the transition? What is the provision for bad weather? Is there sufficient parking available? How many cars can the venue accommodate? Is there valet parking? What are the charges for that? What is the traffic situation in and around the venue? Is there any discounts for weekdays, off-season dates? Do we get a discount if both marriage and reception is in the same venue? Do they have a panel for wedding vendors – caterer, decorator, Dj? Can we hire from outside? How many vendors are there in the panel? What are the starting charges for decoration and caterer? Is the venue licensed to serve alcohol? How do you charge for alcohol? Is it per person, by consumption? Are there additional charges for bar staff? Are there any alcohol packages? Can we bring our own alcohol to the venue? Does the venue have its own sound equipment? Is a baraat allowed to make a procession and come to the venue? Are you facing any problems booking your wedding venue? Are there any other questions that need to be included in this list? What & Where to shop in Lajpat Nagar?